For many cleanroom applications special gloves are needed to protect the user`s hand as well as the product. We offer a wide range of cleanroom gloves. Depending on the field of application, for example semiconductor industry and also at doctors and medical centres, the requirements are very different: Good touch, antistatic properties, good grip, heat resistance and a lot more. While in the chemical industry the chemical resistance and in the electronic industry the ESD suitability are focusing, disposable gloves of latex, nitrile or vinyl are mostly used in the medical area. In our delivery program you find a good selection of different gloves, as for example disposable gloves, nylon gloves, antistatic gloves, cut resistant gloves, acid protection gloves, polyurethane gloves, innergloves as well as heat protection gloves. 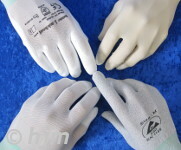 Please let us know, if you need assistance to find the most convenient cleanroom glove for your application. We can provide sample gloves for your testing purposes. Please contact us.